With regard to workplace safety, the Nisshinbo Group’s conduct guidelines emphasize placing top priority on safety in its business activities. The Group accordingly conducts regular safety and health activities, promotes individual physical and mental health management, and strives to ensure a safe and agreeable workplace environment. In fiscal 2017, we worked toward several safety targets: zero major accidents*1, a frequency of injuries in Japan with lost work days*2 of 0.3 or less, and a frequency of injuries in other countries with lost work days (excluding the TMD Group*3) of 0.2 or less. To reach these goals, we worked to instill priority policies at each Group company, ensuring thorough awareness that safety takes priority in all endeavors, continuously promoting risk assessments (of work, equipment and chemical substances) as well as thorough preparation and adherence to rules during inspections and response to equipment malfunction. We conduct risk assessments on work, equipment and chemical substances on a scheduled basis according to annual plans at each factory and sequentially execute preventive measures determined in order of priority. We also strive to prevent accidents through small group activities, including danger awareness training and near-miss reports. We hold Group training sessions covering risk assessment perspectives and implementation methods, aimed at increasing understanding among individual companies’ safety managers and augmenting the level of activities. In the event of an accident, we quickly enact countermeasures to prevent recurrence and share occupational accident reports across the Group to prevent similar accidents from occurring in the future. *1 We had defined a major accident as "an accident resulting in a disability grade of six or higher" but the definition for "serious industrial accident" in the Ordinance on Industrial Safety and Health was changed to "an accident resulting in death or a disability grade of seven or higher." We therefore revised our definition to "an accident resulting in a disability grade of seven or higher." *3 The TMD Group uses a different standard for measuring the frequency of occupational injuries, so this is dealt with separately. In fiscal 2017 no serious accidents occurred. 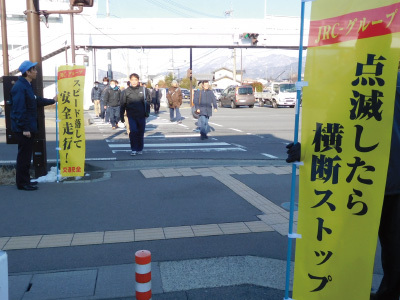 The frequency of injuries with lost workdays at our business sites in Japan was 0.49, lower than the manufacturing industry average but a worsening from the fiscal 2016 level of 0.39. At our business sites in other countries, this frequency improved from 0.71 in fiscal 2016 to 0.53. We will continue to implement guidance at business sites with frequent occupational injuries in the aim to raise the Group’s overall safety management level. As the Nisshinbo Group moves towards globalization, its business sites in other countries have grown to outnumber those in Japan. The management and safety officers of each subsidiary provide on-site guidance on the implementation of policies to prevent the recurrence of occupational accidents occurred in Japan at business sites in other countries. In fiscal 2017 we expanded Nisshinbo Brake’s hands-on danger awareness training to business sites in China and the United Kingdom. By simulating occupational accidents, this training increased individual employees’ alertness to danger and raised safety awareness. We also continue fostering an awareness of the dangers of chemical substances, promote the thorough use of protective equipment and work to prevent health problems. The Nisshinbo Group conducts regular occupational safety and health audits of its manufacturing sites in Japan. A monitoring team composed of the Health & Safety Group from Nisshinbo Holdings Inc., labor unions, safety and health management staff representing each business, and safety and health officers of other business sites checks the state of safety and health management at the targeted business sites. In fiscal 2017, regular occupational safety and health audits were conducted at 30 manufacturing sites. At the end of the fiscal year, we prepare a comprehensive audit report based on these audit results. We also share accident risk analysis results and case studies of excellent activities throughout the Group and incorporate them into occupational safety and health activities in the following fiscal year. In fiscal 2018, we will begin expanding these audits to our business sites in other countries. We conduct a management review at the Corporate Strategy Conference on the achievement status of the Nisshinbo Group’s safety and health targets, the status of occupational accidents, the results of safety and health audits, and other items. This information is fed into action policies and the setting of targets for the next fiscal year. 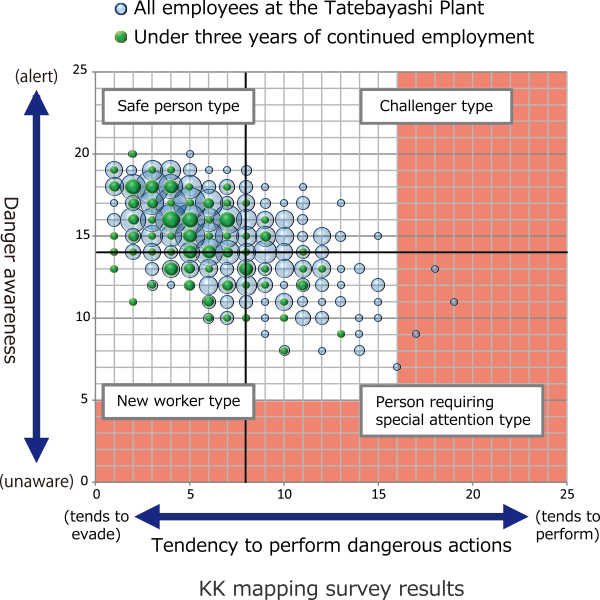 KK mapping evaluates employees’ danger awareness (the ability to recognize danger) and tendency to perform dangerous actions (the tendency to perform dangerous actions despite recognizing them as dangerous) with a simple survey and classifies them into four types: "safe person," "challenger," "new worker," and "person requiring special attention." Utilizing these results makes workplace improvements and effective safety training possible. Therefore, the company expects KK mapping to help eliminate occupational accidents due to human error. Nisshinbo Brake Inc. first introduced KK mapping in fiscal 2016, targeting 10% of its employees in Japan and other countries. As a result, we were able to evaluate the trustworthiness of the results obtained from the survey and in fiscal 2017 we applied the system to all employees at our Tatebayashi Plant. In 2018 we will use these results to provide training aimed at improving danger awareness and reducing the tendency to perform dangerous actions. 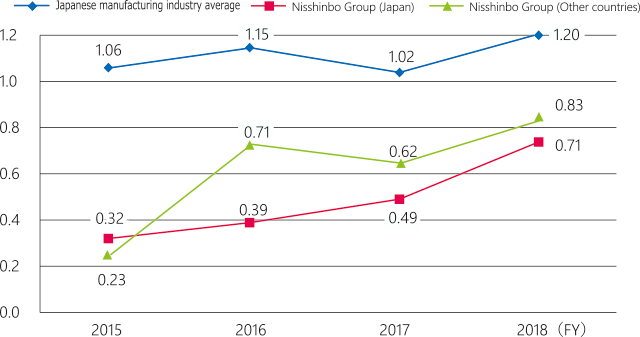 Nisshinbo Textile Inc. has been conducting its improvement activities, called "T-KAIZEN," internally at its subsidiaries in Japan and other countries since 2015. It coined a slogan, "Passion for Our Future," and logo and rolled out a video message from the president calling for every employee to participate in these activities. Beginning with improvement proposal activities conducted at the management level, the company has now brought in external consultants and, based on Toyota’s production system, is aiming to improve its on-site strength at both its Japanese business sites and its Indonesian subsidiaries. Nisshinbo Textile is also conducting safety activities as a part of T-KAIZEN with the idea that safety is our top priority. The company is working to avoid occupational accidents utilizing methods such as 5S, standardized work sheets, "five whys" analysis and small group activities. It is also conducting special safety audits at workplaces where occupational accidents took place and creating educational reenactment videos for later distribution with the aim of eliminating workplace accidents. The Nisshinbo Group recently established the following Nisshinbo Group Health Management Policy to clearly express our health management efforts. We will promote various health measures from now on in line with this policy. Nisshinbo Group, through the establishment of an environment where each individual member can play an active role by promoting employee’s health and sound workplace, aims to be a corporate group which is indispensable, at any time, for our society. New Japan Radio Co., Ltd. has been conducting health management in pursuit of becoming a "Healthy Company" since April 2016. These initiatives were well received and in fiscal 2018, New Japan Radio was selected for the Certified Health and Productivity Management Organization Recognition Program’s "White 500" for the second year in a row. 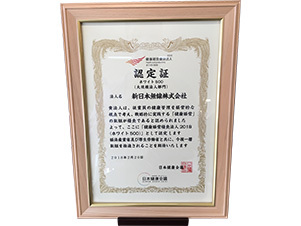 The Japanese Ministry of Economy, Trade and Industry conducts this certification, which honors large-scale corporate entities for excellent health management, in collaboration with the Nippon Kenko Kaigi. 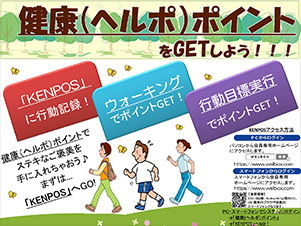 As New Japan Radio’s Healthy Company activities entered their second year, the company started its health point (Helpo) system in fiscal 2017. This system was started in addition to the company’s secondhand smoking prevention measures and its "10 minutes more walking challenge program," which fights deficits in exercise by encouraging employees to walk just ten minutes more. The Helpo system encourages employees to improve their health independently by awarding incentive points that can be used to purchase various products. About 40% of employees participated in this program during its first year. Moving forward, the company will continue to strive to become a Healthy Company through various programs and plans.